DNA Micro, Inc. is a technology services company focused on bringing our clients vision into reality. We are celebrating our 15th year in business and collectively bring expertise for all industry segments. We understand what the best software engineers want: steady work, a challenging environment that encourages the advancement of your technical skills, colleagues who know what they are doing, and an employer who invests in the future of both people and technology. If you want to learn from and be challenged by a team of highly qualified peers who play at your level, and if you like to get your hands on new technologies, you’ll be right at home here. Your skills will be continually developed and improved – as one of our engineers said: “In the past two years, I’ve become the person I used to go to for advice." The candidate should have comprehensive knowledge of iOS , Android SDKs and Server integration (Representational State Transfer (REST) endpoints). Willing to train exceptional new graduates, or developers with limited experience. If you love to code and are willing to work hard to accept the challenges of being a professional developer, email us and tell us why we should hire you. 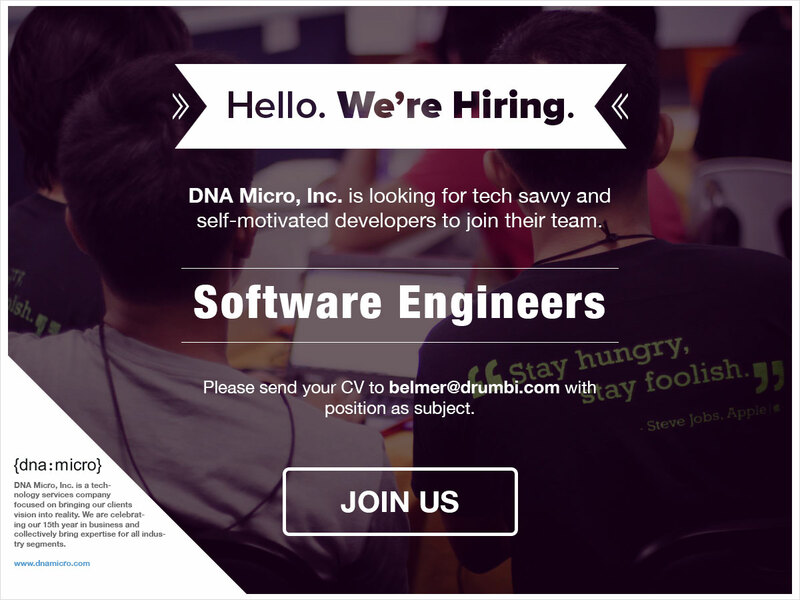 Please submit your Curriculum Vitae (CV) to belmer@drumbi.com with position as the subject.